[無料] Card Game Simulator | Mac App Storeのアプリ検索・ランキング BuzzMac! You can download additional games by hitting the top banner of the Main Menu. In the Game Selection Menu, hit the "Download" button in the top-right. Then, enter the CGS AutoUpdate URL for the game you would like to download. You can also define your own custom game(s) by following the Custom Games Documentation on the CGS website! When joining a friend's game session, CGS will be set to use the same card game that the host has selected. 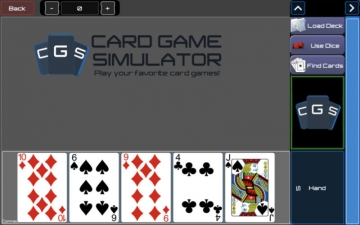 If you do not already have that card game, CGS will automatically download it. When you enter a game, you will be prompted to load a deck. Some card games will come with pre-built decks, but you can always create new decks by writing in card names or with the visual Deck Editor.